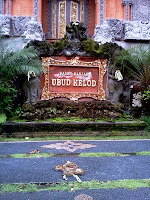 Bali is all about balance – of good and bad, male and female, pure and impure, sacred and profane, light and dark, life and death, sekala and niskala. Eagle and Condor. This I learned on a recent three-week journey to that small Indonesian island in the Indian Ocean. 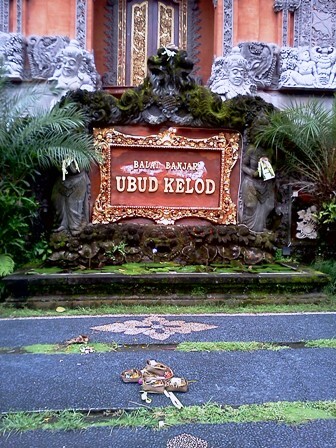 The Balinese belief system, a mixture of Hindu and indigenous traditions that go back thousands of years, recognizes that the world we experience is a product of the interaction of sekala and niskala. Sekala is the surface, external, material aspects of the world. Niskala is the meaning, spirit, or essential life force underlying what we can see and touch. Every morning, the Balinese place offerings, called cha nang, everywhere – in front of houses and hotel rooms, on scooters, on cars, in doorways, on stoves, on shrines, in rice fields, on trees, everywhere – to honor and celebrate the spirits, good and bad, that reside in them. The cha nang are tiny baskets filled with flower petals of various colors. The baskets are square, triangular, or circular in shape and hand-woven from strips of palm leaves. 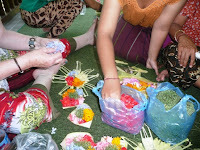 The photo at left is from a cha nang-making class. In seeking to maintain balance, the goal is not the good defeating or triumphing over the bad but about maintaining the balance and redressing imbalances. Both poles are needed for an integral Earth and so are honored, celebrated, embraced, and kept in perspective and balance. With cha nang offerings, prayers, and festival celebrations, both good spirits and bad spirits are acknowledged and honored in order to keep them both “happy” so they won’t cause trouble. The photo at right is of a cha nang offering placed in front of a community hall. Associated with balance is the concept of direction. 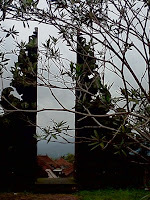 All Bali refers to Mount Agung for directional orientation. East is east and west is west, but north and south are not what we are normally used to. Instead, toward the mountain replaces “north”, and away from the mountain replaces “south”. The photo at left is of the misty morning through a gate at Temple Besakhi on Mount Agung. Toward the mountain is holier, more pure. Away from the mountain is less holy, more impure. Rain water flowing down the mountain gathers impurities and washes them to the sea, which swallows them up into a black hole at the bottom. The water is then purified and recycled out of the hole and the sea, back to the top of the mountain. Essentially, a waste water treatment cycle. These are but tiny glimpses into Bali and its people. Many tomes have been written about them. I highly recommend the two-volume work by Fred B. Eiseman, Jr., called Bali: Sekala and Niskala. Volume I covers religion, ritual, and art, while Volume II examines Balinese society, tradition, and craft. The journey was for me an experience of an alternate reality such that, after returning home to life in California, I am still not sure which reality is “alternate.” Perhaps both are. The concept of "balance" reminded me of one of Derrida's "Deconstructionist" concepts in his theory of language. In brief, he says that when we use a word such as male, we are also giving meaning and value (or lack of value) to the opposite word, female. If we use the word "war" we are also giving meaning and value (or lack) to peace. In our culture we often "throw the baby out with the bathwater", which is to say we take one term and give it significant meaning and value, and de-value the other, failing to inquire into its meaning as well. It is something like talking about an object in a painting and ignoring the "negative space" which defines (shapes) the object. It is our typical way of thinking in "either...or" modes instead of a more inclusive mode in which a balance of inquiry would be essential. Thus if we inquire into the term "peace", we need also inquire into the term "war" so that we can understand both sides of the pendulum--balancing the inquiry before we make our judgments.